Hi, this technical blog will contain urls/tutorials that relate to latest technology. More so, I will also attempt to write tutes on my own to simplify things that are too complex. Thanks for your time in checking out this blog. Friends, I have moved this tech blog to my own domain. You can now read the blog at http://tech.aswinanand.com/ and get your feeds at http://tech.aswinanand.com/atom.xml. P.S: I posted this message long ago on my non-tech blog and completely forgot about posting it here. Hi guys, wordpress 2.2.2 has a problem of importing blogger blogs to wordpress. It happens when you get an error saying, "We were not able to gain access to your account. Try starting over." This problem can be resolved only in custom wordpress installations i.e. you have your own domain on which you have installed wordpress (downloaded from http://www.wordpress.org/). After login through FTP (Example FTP client is filezilla) to your web hosting provider, locate the folder where you have installed wordpress. In my case, I have installed it in a folder called "blog". Locate the folder "wp-admin". Inside wp-admin, select a folder called "import". Open the "import" folder. There's a file called "blogger.php". Download the file to your computer. Open the file in any of the popular text editors and go to line number 87. It looks like the first screenshot. Line number 87 is highlighted in blue. Change "www2.blogger.com" to "www.blogger.com" (Refer to screenshot below). Save the file and upload it to the same folder from where you downloaded it. Everybody among the geek circles would definitely know of Digg. The one stop for all news; especially technology. Yes, digg has now accumulated so much information that it gives out relevant search results for many technology queries, in some cases better than Google. Here are it's few advantages. 1. All diggs/links are user generated. 2. Most relevant search results are relevant. 3. Since everything is user generated, digg has a wealth of information regarding user behaviour, browsing habits and a whole lot of other things. You can even call a "mini" google history of the guys who digg the posts. 4. It's an awesome complement for the existing search technologies. 5. Top diggs are comparable to the first page results of google search. There are more, but I'm unable to think of them now. Hi guys, I use the MT880 Huawei router for my broadband connection. I use the connection not as a dialled one as mentioned here but as a gateway; meaning, you can just open your favourite browser and start surfing the internet. When I use the router as a gateway, I cannot give my system IP address to my friends to test any webpage because the router acts as a proxy. The only solution for this is port redirection. Port redirection means that a request on a particular system on a particular port will be redirected to another system on another port. I had been trying in and out to configure the "Virtual Server" section to redirect to my system but in vain. Today, I found an excellent tutorial in one of the forum threads at vinuthomas.com, explaining the steps to achieve the same. I have downloaded the tutorial and uploaded it again on my server. 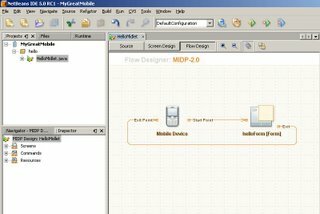 Download it here and enjoy configuring your MT880 router to run your own web applications. Hi guys, due to some mess with mysql and apache and therefore unable to uninstall mysql, I looked thro' the registry to search the entry that was important enough to remove the apache and mysql services. 2. sc delete service_name - where service_name is the service to be removed. 2. Find the service. The 1st column contains the service name. Use this in the sc command. Read more about the sc.exe command. 1. Figure out the layout of your blog. That is, you should be clear about what should be placed where. Ofcourse, it's entirely at your discretion. Have a look at the simple style sheet for the basic layout. Save this as "style.css". We would need it later. Now that you have saved it, open the HTML file in a good text editor. You can see <div> sections that are tagged with "header", "footer", "sidebar" and "content". 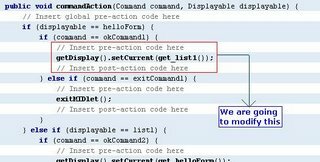 Let us create the header file. 1. Open notepad, and paste the code shown below. Save this file as "header.php". 2. Copy the fragment below and save it in a new file as "footer.php". 3. Copy the sidebar code and save it in a new file as "sidebar.php". 4. Last but not the least, let us create the "index.php". If you notice, there are special lines such as "<?php get_header(); ?>", "<?php get_footer(); ?>", "<?php get_sidebar(); ?>". These are the functions that are used to glue the content with header, sidebar and footer. Great! we are almost done... few more minutes. 5. Create a new folder and name it as "DarlingTemplate". Move all the newly created files, including the "style.css" to the folder. To test the new template, upload[:1] this folder to the <Wordpress_install_location>/wp-content/themes folder. Login to your blog and you will see the new template under the "Presentation" tab. The last post was on setting up the Nokia S60 SDK with netbeans 5.0. 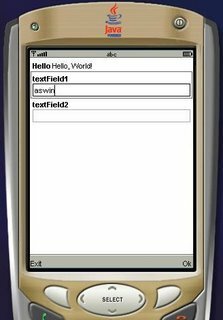 The application we are going to develop now doesn't require the Nokia SDK. It is required only when you want to implement Nokia specific features. By the way, MIDP is called Mobile Information Device Profile. Two common versions of MIDP supported by most mobile phones across manufacturers are MIDP 1.0 and MIDP 2.0. 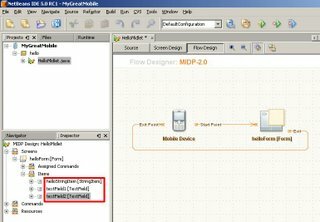 MIDP on combination with CLDC - Connected Limited Device Configuration - allows us to build device independent applications. 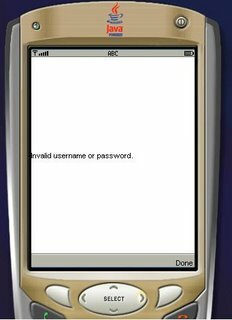 Both of them are products from Sun Microsystems. You can read more about MIDP here and CLDC here. Look at the huge list of mobile phones that support MIDP and CLDC. 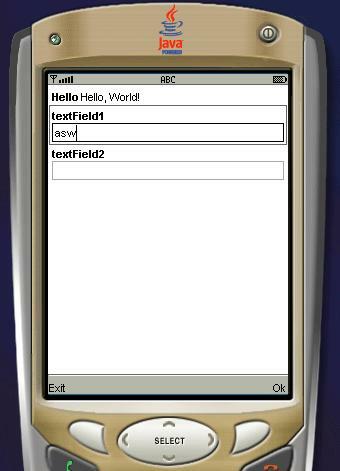 For this application, we will use the standard emulator that ships with the netbeans mobility pack. 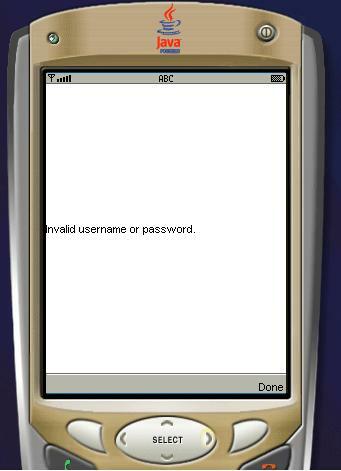 We will create a simple application that accepts username and password. If the username is "aswin" ;) then it will take you to the next screen. Otherwise, it will display a small error box. Understood?? Ok, be a good student and fire up Netbeans 5.0. 1. Go to File-->New Project. 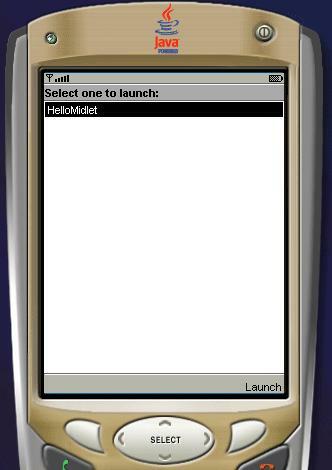 Select "Mobile" on the left pane and "Mobile Application" on the right pane. 2. Click "Next" and give the project name as "MyGreatMobile". Click "Next". 3. 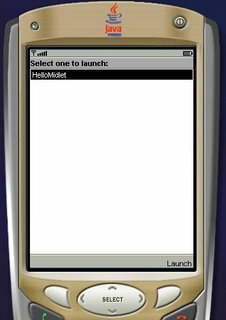 Select the Emulator Platform as J2ME Wireless Toolkit 2.2. Leave the other settings as it is and select "Finish". You should have something similar to the one shown below. 4. Choose Window-->Palette. The Palette window is now displayed. 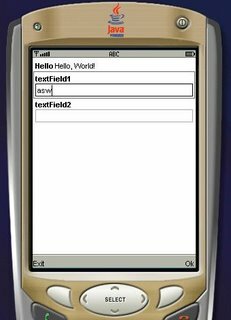 From the "Form Items" section, drag and drop 2 textfields on the "HelloForm". The whole window should look like the one shown. 5. From the "Commands" section of the Palette, drag-n-drop and "Ok Command" and a "Exit Command". Press F5 at anytime to view the output on the emulator. 6. 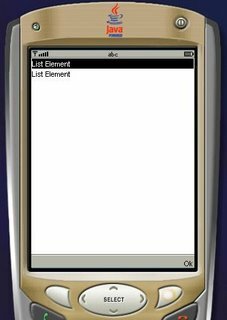 Drag-n-drop a "List" and an "Alert" from the "Screens" section of the Palette. Link the "Ok" of "helloForm" to "list1". 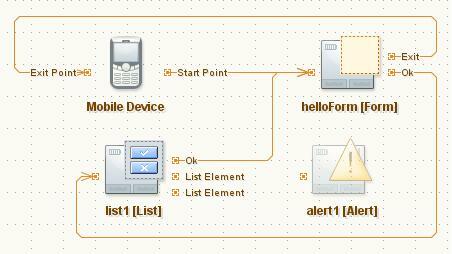 We will link the Alert programmatically. 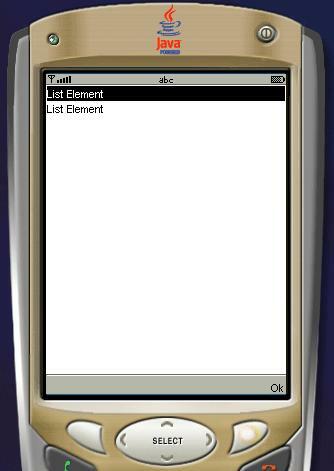 Also d-n-d a few listitems from the "Elements" section and a "Ok Command" onto "list1". Link the "Ok" of list1 to Form1. Check the screen shot below. 7. Double click on alert1 and change the text to "Invalid username or password". 8. 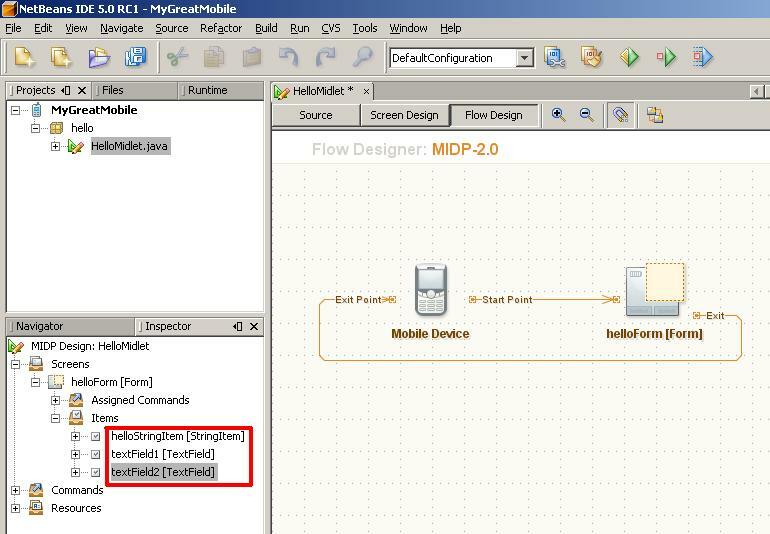 Now, if you switch to the Source view from the Flow Design view, you will be able to see that all the necessary code is generated, to implement the functionality shown in the flow design. THAT IS AMAZING! Let us switch to Source view and do some tweaking to get the functionality we want. 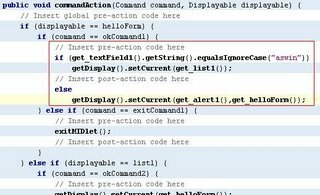 Find the function called public void commandAction. That function implements all the necessary conditions for navigation. It initially looks like below. 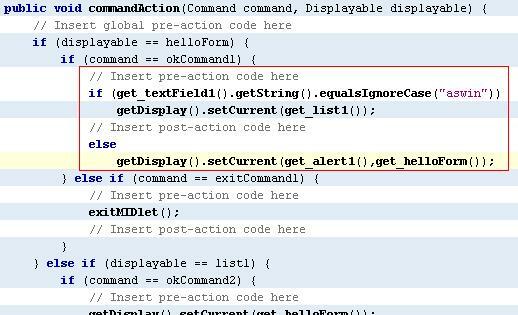 Change the code so that it is similar to the next screen shot. The next post will be on consuming .net web services on Java ME. Bye! !